Your Yacht has been specifically designed and custom built exclusively for your comfort on charter. Your Hosts have set the standards for experience, skill and professionalism. Once aboard you'll find an enthusiasm for fun that will capture your days. Your Vacation will be tailored to your dreams. It will be the vacation of a lifetime, unless you are lucky enough to come back again next season! BREANKER can accommodate 8 guests in 4 cabins. The Master cabin has a queen size bed, shower and toilet. 2 Guest cabins have a queen size bed, bath/tub, shower and toilet. A Guest cabin has a queen size bed, shower and toilet. BREANKER is fully air conditioned through out (there is a small additional fee for A/C all-night). Crew has a separate companionway, heads and shower. Not Insured, Crew certified, Diving if certified, Snorkelling gear, 12 Tanks, 8 BCs, 8 Regulators, Diving for up to 6 guests is included. Gear rental is $150/diver/week. Kristian is by all rights a master shipwright, having operated his own yacht repair and wood working shop for years, though his education led him to fine arts, especially in art weaving. 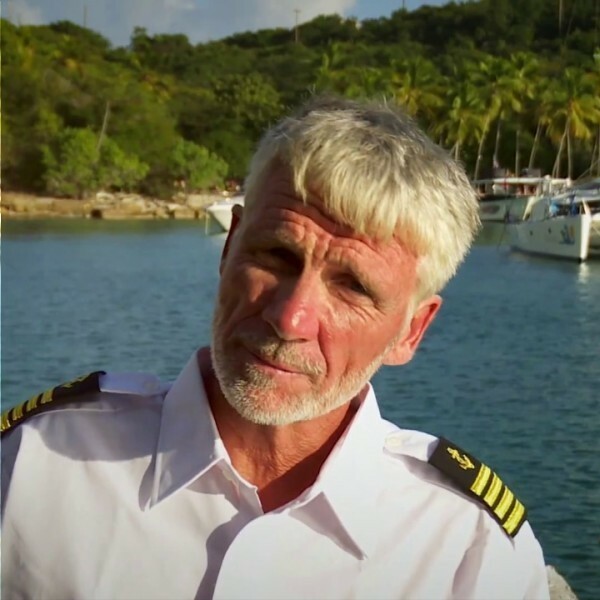 Kristian also has a passion for water sports, especially diving, and he is happy to share the fascinating marine life of the Caribbean with guests. Marianne and Kristian look forward to making your cruise aboard Breanker the most relaxing and enjoyable vacation ever. Marianne holds an International Yacht Master 3rd Degree license, and Kristian holds an International Yacht Master 1st degree license. Marianne also has a university degree in education, and is a master of the art of canvas work and upholstery, having owned her own canvas and sail loft for a number of years. Her father was a chef, and Marianne was brought up close at hand and instilled with a love of cooking and a keen interest in fine cuisine. Their extensive travels have only served to broaden Marianne’s culinary horizons and gourmet options, creating mouth-watering delights for the many guests she has welcomed aboard for the past many years. We have done this chartering 4 times and Breanker crew have been the best for our eclectic guests. They took us to places we never saw in the past they are magnificent, for any of your future guests. Such a wonderful, wonderful week for a couple of water novices. Beautiful part of the world and I can’t say enough about how much we enjoyed our time with Kristian and Marianne. We felt so comfortable with them sailing their “home” with us. Lovely, capable and easygoing couple. Food was fabulous. Can’t wait to do it again with the kids. Thanks so much. Maryellen and I had a great time not water people in general, we learned about sailing and navigation. Never knew anything about a catamaran either. Food was outstanding, snorkeling, SUP boarding and shore trips were great. We went with three other couples and have had a lot of laughs. Kristian and Marianne were very hospitable and we were treated like family. Thank you for an experience of a lifetime. Kristian and Marianne, thank you, thank you, thank you for a trip of a lifetime. Shane and I cannot thank you enough for such a great week on the water. You both are so warm and great travel storytellers. We will never forget this trip. Shane will tell stories of his time at the helm and I am sure the stories will grow as the years go by. I hope that our path will cross again someday – somewhere – we have grown to love you both. It is tough to imagine a better way to spend a week; unless of course you hate gorgeous sunrises and sunsets, beautiful islands, crystal clear Caribbean waters, terrific snorkeling and out of this world food! There is also the perfect sea breeze in the front of the boat, time to read in the sunshine and Kristian’s drinks to contend with…. Tough duty. Thank you, Thank you, Thank you!!! A week on Breanker with good friends was exactly what this Iowa group needed! Marianne and Kristian were the perfect hosts. The food was fabulous, the accommodations were excellent, and the daily experiences couldn’t be beaten. We promise to spread the word that Breanker is a bucket list trip! Thanks you so much for a great trip! The islands were beautiful, the boat was delightful and Marianne and Kristian were amazing! Muskmelon cove, the Beeline bar and Foxy were amazing. Marianne’s cooking and Kristian’s bartending were superb. Hopefully we are back soon! We are so honored to get to join this group of friends and crew on this sojourn around the islands of the Caribbean. Det bedste er “danks Mad” - (the best is Danish food)! Nothing better! We will have wonderful memories and pictures to remind us. What a trip! Great food, great views, great booze and great hosts. The waking up to a delicious breakfast every day was always a delight. Great fun and would love a return trip! WOW! What a wonderful trip! Such great hosts: The sights were perfect, the food and thoughtful service were perfect! Hate to leave – we will be back! Thank you so much Marianne and Kristian. Thank you for sharing your wonderful boat with us! An idyllic way to experience the Islands we wont forget. See you again! Thanks for making each day a wonderful combination of fun, excitement, relaxation and luxury! Thank you for a fabulous trip! The waters always perfect and we always found the best harbors thanks to you! 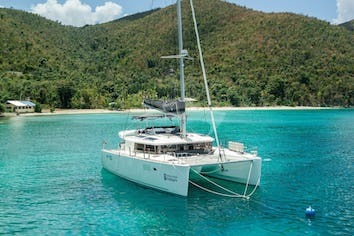 What a fabulous week we’ve had cruising the BVI on Breanker with you, Kristian and Marianne! So many new beautiful new spots, exciting outings and always your relaxed and experience and guidance on what to do each day. We felt truly spoiled by the delicious and beautiful meals and service too! So great meeting you both – thank you! Well…what can I say… This trip has been absolutely amazing! The food, fantastic. This boat…. Amazing and the company have been incredible! Ask for a painkiller and you get the best we had on this trip! We can’t wait to come back. Thank you for everything! This trip has been more that we could have imagined! What a fabulous trip! A fantastic boat, crew, and the best food I have had in a long time and Kristian makes better painkillers than any bar in the BVI. Your patience is matched only by your hospitality. Thank you for making us feel like more than family. We cannot possibly thank you enough. A wonderful trip all the way around. Marianne and Kristian are welcoming and helpful. The food is great and the anchorages are gorgeous. We will definitely be back with others. A week of pampering on Breanker with amazing friends, old and new. Many thanks to Kristian and Marianne for new memories. Your attention to detail and our every need was seamless. Your hospitality is second to none. The food – always made with an extra special touch of love – delicious and tasteful and beautifully presented. The expert guidance and knowledge of the area meant we experienced the common and uncommon. The comfortable staterooms and appointments carefully attended with decretive ease. I understand how they are respected as seasoned charter hosts – experience matters! What an awesome week! You spoiled us! We had it all, wind, rain, sunshine and lots of fun and relaxation! The food was amazing and the drinks superb! You do a fantastic job on Breanker! Thank you! Many memories created aboard Breanker. Thank you for making my 60th Birthday a success. Always paddle your own canoe! For my first time in the Caribbean I am totally spoiled. This has been one of the best vacations I have ever had. Your hosting is awesome – the food – the staterooms – Breanker and all your wonderful stories have been delightful. I can only hope that I will be back again before too long. Thank you for a fabulous week. We enjoyed being with you both on your lovely boat, and loved the beautiful destinations you took us too. The food was spectacular, and thank you for attending to our every whim in such a gracious manner. We greatly appreciate the dolphin show you put on for us! We hope to see you again soon. Rachel, May, Paul and Andree. Thank you for an amazing week with you! We loved every destination and experience, especially with your special insights! The only way to experience these islands! And thank you for making us all feel very much at home with you. Thank you for all the delicious meals – and new ones for the kids! LOVED THE SAILING! We loved our lesson on the Danish culture and our conversations on world travel! The destinations were fabulous – swimming with a 6’ nurse shark today was new for our family Jthank you for spoiling us in every way!!! Thank you for a great trip! I appreciate that you took us tubing frequently. The food was great (especially the pancakes). I had a lot of fun sailing and exploring the islands! Thank you for a great trip and thank you for taking us tubing. The food was great especially the pancakes, tuna, salmon and Key lime pie. I had a fun time sailing and exploring the island and water. Please visit us in NC. Kristian and Marianne – What a delightful surprise to encounter the two of you! From day one, you welcomed us in to your life, treated us with the outmost care, tolerated all our fobies and idiosyncrasies with patience and kindness, and made us all feel like family. You showed us how the islands have changed from the hurricanes and at the same time and at the same time showed us the human side of a natural disaster, as well as economic, botanical, geographical and oceanographic effects. What an education! More people needs to come down here, not to exploit, but to understand how we can all do our part as human beings helping human beings. All I can say about the food is YUM!! The garlic dipping sauce, pancakes the size of your head, beautiful salads and mysterious smoothies – WOW! Every meal was a treat! Most of all you feel like family to me, and I thank you so much for that. Much love and we will all be seeing you soon. This trip was amazing I loved everything about it. I loved seeing the sea turtles and dolphins. I especially want to thank Kristian and Marianne for making this trip what it is. Without you I would not know what to do. You brought this trip to life. Tusind tak, Gage 12 years old. Xoxo! I will miss you. Hope to see you in person again! Kristian and Marianne, Thank you for allowing us in to your home. What an incredible trip with the best hosts. I loved all the stops and the islands in between lively and remote – it was so much fun to spend the week with such seasoned professionals. I really appreciated the food, thank you for preparing such melting delicious meals. I hope we can cross paths again someday. Marianne and Kristian – I knew that spending time island hopping would be an incredible experience. But I did not even consider what a difference the crew would make. I had planned surrendering myself to the rhythm of the water, the tempo and the island life, but you two made the experience of fully letting go transformational. Because you know the area so well and are tapped into the energy, every place you took us and every time we arrived, were perfect. I absolutely trusted having your directions and guidance. You have the ocean, the wind and boat in your bones and that makes you the perfect hosts – not just of your home but also of the entire experience. I was truly taken to another place – I can’t thank you enough for inviting us in and taking us there. Well…Another voyage another great time with family and our extended Danish family. So difficult to express all the reasons that we come back, just happy that we do! Be well with favorable seas till we cast off again. Thank you so much for another vacation on the Breanker. As always the sites were beautiful, the food was delicious and the hosts were wonderful. Life on the Breanker is always perfect. Another time and still the same charm. Can’t wait to hear how Kia likes Copenhagen and Møn. Always a pleasure talking to you and Kristian. #4 but we have so much fun each time it seams like#50 J Our time with you guys is always incredible – we will keep coming back year after year! And hopefully we will see you in Denmark too!! I could not figure these guys and had to come back to check them out. Well; they are nice, hospitable, caring and in summery as good as mama’s milk. Full enlightment came after fourth trip. Don’t miss an exceptional time in paradise with angels Marianne and Kristian. We love you both and the Breanker! Always thankful for you kindness and attention. Always in our best memories. I love talking to and spending time with both of you and you always know the best places to go. You guys make every trip special, thank you! Until next time, we wish you smooth sailing. Mange tak!! Tusind tak!! Making the complexities of sailing the USVI and BVI look absolutely effortless and simple. Your sailing skills and experience kept our families safe and well taken care off. The travel, locations and the total experience were made only more amazing by your wonderful personalities. All week we felt like we were sailing with our family. We can’t wait to find you in Denmark!! Everyone! I have something to say; To Kristian and Marianne, Thank you for everything you do to us. Thank you for changing my mind about food!! This was one of my best VKs (vacations) I have ever had. If I could do it again I would. "Tak" you very much for an amazing holiday. Thank you for another wonderful week of beautiful sites, laughter, catching up and wonderful food. Your hospitality and attention to detail to create an outstanding experience. Although the islands are damaged there is resilience and welcoming at all the places we visited. The water is beautiful and beaches are still paradise. This is still our happy place J. We already look forward to seeing you again. Thanks so much for an outstanding trip. Kristian and Marianne. Thank you for a truly amazing week in paradise. You were the perfect hosts and always making sure our bellies were full and our drinks cold. Marianne, your meals were all incredible, I don’t know if I can pick a favorite but the ahi tuna was up there! Everyone on the islands was so welcoming. Jost Van Dyke and Norman island was my favorites - I can’t wait to come back and visit again. Marianne and Kristian. This is our second time on Breanker and we had a blast! We were so glad that Breanker survived the 2017 hurricanes. The ocean is still blue and the people are so welcoming. Thank you both for a wonderful stay aboard Breanker. You are both amazing and made our stay so comfortable. Thanks for the fabulous food and great sailing. We WILL be back! P.S. We hope that you will do a Breanker cookbook!! Marianne and Kristian. Thank you, thank you, thank you!!! I have been hearing about your charters from friends for a few years and was so exited to be able to finally experience sailing with you for myself. I had high expectations for a fun time, great views, amazing food and the best company…. You exceeded ALL of my expectations! It is obvious you both work very hard and have a large amount of passion for everything you do. The attention to details, organization and planning is amazing. Full bellies, yummy drinks and the most fun I’ve ever had on a trip, are all thanks to you two. Thank you for sharing this part of your life with us and just know I will be back again!!! Thank you so much for an awesome week!! We were so impressed with how you found beautiful bays to snorkel even though we came post hurricanes! We were happy to place our trust in the experience with Kristian and Marianne! The food, the sailing, the scenery and conversation were all outstanding! Can’t wait to come back! We had a blast, the best food, drink and company. Thank you for making this trip to the BVI’s the best possible. May the wind continue to be at your back and the sun on your faces. Kristian and Marianne. Thank you for a memorable week in the lovely BVI’s. Food and service was fantastic. To Mr. K and Mrs. M.
Thank you for being an amazing couple, caretakers and now new friends. You have shown me a new wonderful world and moreover I have enjoyed each and every second of the experience. Thanks for expanding and blessing my world. Cheers to the next trip, Jessica. Sheryl and I were invited on a charter cruise with our friends. Little did we realize we were just being invited to spend a week with friends we hadn’t met yet… in their beautiful home with amazing food and drinks and wonderful stories. The trip was no pressure, no demands, as if we were old friends getting together for a week. We were guest instead of customers. And we intend to come back to see our old new found friends. Two people we were meant to meet. Good friends have good friends… and now you are our good friends as well. And by the way, thanks for letting us sign the book. Thanks you for all you do and all our love, Sheryl and Ed. I was lucky enough to know Cheryl and Don Wegner, and even luckier that they invited me along on one of their awesome adventures! I instantly felt welcome in your home and found the accommodations to be beyond my expectations. I was VERY well feed, VERY well attended too – and I wanted for nothing. Your expertise with the BVI’s made me feel safe. It was the best vacation I have been on! Thank you for taking me on this great adventure. Kristian and Marianne. This is our 4th time aboard, and we never get tired of you! Again your amazing hospitality, sailing skills and great food made for another wonderful BVI trip. Now we add to the list of compliments, your survivor skills. Winds tore both the awnings – and out comes the sewing machine to fix them! WOW – you’re prepared for anything! And I have to mention how impressed we were that you two can sew together – quite the teamwork! These past two weeks has flown by. It is hard to believe that we have been on 25 charters with you guys since January 2000 aboard Casador. Keith Berger really summed up well why we keep coming back – Breanker is a great boat, you guys do a great job with such ease. It is a privilege to call you “friends”. Thank you for being our home base since our home in St. John was severely damaged by hurricane Irma. We have been able to get a lot accomplice in a short time. We are thankful that Breanker survived both Irma and Maria and is in such a good shape. We really enjoyed our time onboard and look forward to # 26! May the rest of your season be blessed!! Thank you for such a beautiful week. To be with you on Mart and Jodie’s 25th trip with you was special. As I look back on the week a few things come to mind…. There is a way to know someone by simply watching what they do. In this past week it has been a work of art to watch you both. You are amazing craftsmen in all the parts in your work and service: Economy of motion and grace with the boat, exquisite dishes on the table, attentiveness to the smallest of details in every way. That kind of pride in your craft is beautiful to see and a real part of the joy in the trip. But then there is the ease of friendship and laughter with you that makes the trip unforgettable! Thank you so much for letting us into the stories of your life on boats and the glimpses into your home in Denmark. We have rarely felt more “at home” with people we just met. But thank you for a beautiful week. Breanker is a beautiful boat and you both are a grace to the islands. 25 times on charter with Kristian and Marianne - This calls for champagne! My highlight was snorkeling; I had so much fun at Buck Island with the sea turtles. JackI enjoyed snorkeling at Peter Island. I started this trip at a 0 out of 10. I was terrified of the ocean and apparently had a large seasickness that I did not know of. I couldn’t look at an ocean swell without being scared and my heart beating fast. The first morning when I woke up and threw up for 30 min. off the side of the boat really solidified to me that I shouldn’t be on the water. However, all I needed was a day and you guys made me feel so at home, (ocean included). Somehow with your guidance, and calm, cool collectiveness, I was able to ease my way into the ocean and overcome (not all the way) my fears. I saw dolphins, swam with turtles, heard “shark” and got out of the water (Thank Good), and so much more. The food was incredible and the company of you guys was so much better. Wish you nothing but the best! Thank you so much for our second charter experience. We loved the USVI way better and this was the perfect week away. Thank you for you hospitality and for keeping our bellies full. As always the food was amazing. I feel this trip was extra special given all the animals we got to see – sea turtles, an octopus, a sand shark etc. The jumping stingray was also amazing! Since our sister and brother in law missed the trip due to their Breanker baby, we will be back again soon! Have a safe travel to Denmark and enjoy your time off with your family! Wishing you all the love and happiness. Lighting does strike twice! This our second trip with you and again the adventure was one to remember. I especially appreciate the way I can share with you what our family likes to do and you then take us to the place where that vision becomes reality. Private beaches, coral reefs, hiking trails, visiting old plantation ruins, and spending a night listening to live music in a cozy island bay bar! More happy days to you both. Dave and I would like to thank you for your graciousness this week – we loved spending the time on Breanker with you both as our hosts. It’s difficult to have four couples with different needs and expectations, but you managed to make it all seem seamless and to make each couple feel completely spoiled. And as special as this past week has been, with so many fun and different moorings, I think that the one thing we will treasure most is meeting the two of you and getting to know you. We wish you the best in the future adventures and truly hope to be able to spend more time with you on Breanker again! WOW what a wonderful week! We greatly appreciate your hospitality, flexibility and unfailing good humor this week. The food was marvelous, the boat and the amenities perfect – you just made it seem so easy. THANK YOU for a perfect week and we look forward to joining you here on Breanker again in the future. In the meantime we will follow you on the net and wish you safe travels and fair weather. Thank you again for everything. The two of you have given us a trip of a lifetime.I say, as we won’t be back! But we WILL! Your command of your boat, incredible service and fine dining has given us a wonderful experience. We are so grateful! Being boat people, we understand the work and concern you have to have to run a week with us charter folk. We were able to relax – 100% confidence in you both. Some thing new for us for sure. You both have been so genuine – we love you and welcome you in to our family! We know for a fact that we will continue to be in touch. Our lives are now intertwined. So…. until we meet again…. Stay healthy and strong! Keep eating your healthy food and drinking water! AMAZING – AMAZING – AMAZING! We had such a wonderful time on board your beautiful boat. It was a trip of a lifetime. We loved all the wonderful food and great wine. You both are so wonderful and you made us feel so much at home. We will follow you on FB. Let’s keep in touch and we will be back again. Thanks for all the great memories. We love you both. P.S. Come and visit us in Destin. We would love to have you both. We will take you out on our boat. We can’t say enough to express the wonderful hospitality, culinary and sailing expertise! Of Marianne and Kristian - They keep such a clean boat and clearly they are so organized with their years of chartering. We felt so pampered with food, drink, dinghy-shuttle and tour guiding by these lovely warm people. 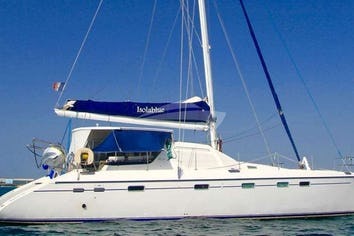 I can only hope that we might be able to come again on a charter with Kristian and Marianne. Oh, and it was so fun for snorkeling! We loved the Bath and the Dogs Isle for this the best.If you EVER decide to enjoy seeing Minnesota in the summertime – we would LOVE to host you - In fact, we would include some boat time of the St. Croix River too! I hope we keep in touch for a very long time. P.S. I hope they do not have a bouncer who will force/through us off the boat! Today is our final day in our precious 7 days! We had a wonderful time exploring the islands and swimming in the beautiful blue water. Before we came we thought we knew about the treasures here in the USVI and BVI… We thought is was the brightly colored fish, amazing beaches and the crystal clear water. It turns out the real treasure was the friendship we now have with Marianne and Kris. We will cherish our time spend with them and look forward to our return trips. Thank you 100,000 times. Thank you so much for a wonderful week! This was our first time on a sailing charter and the experience has been fantastic! As a matter of fact – this was our first trip – big trip – as a couple and we didn’t break up! We will be talking about all of our adventures, the beautiful sights we got to see, the fantastic food Marianne prepared for EVERY meal, the comfort of Breanker, our knowledgeable captains and all of the wonderful memories we made with our friends. Thank you so much for all your hospitality and sharing so much information about your selves and the BVI and USVI! It has been a vacation of a lifetime! Kristian and Marianne this was our third charter on the Breanker and we had an absolutely fabulous time. 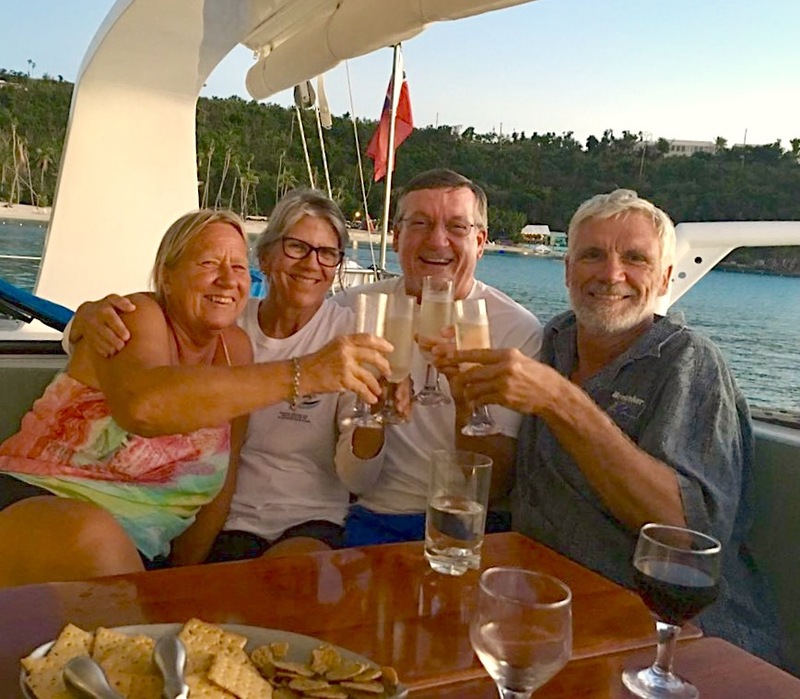 Kristian and Marianne are the most welcoming and enjoyable hosts – we would not ever consider chartering with anyone else. They always go out of their way to make sure that their charter guests have a wonderful time. Marianne’s cooking is spectacular and the meals are healthy too! Although this is only our third charter it feels like we have known Kristian and Marianne for 10 years. We had such fun every night laughing until our stomachs hurt. The trip was pure joy for us. We are so relaxed and happy that we do not want to leave the boat. We will most definitely charter with them again. Thank you both for making our trip so enjoyable and memorable.P.S. Also I meant to mention that Kristian and Marianne keep Breanker in such good condition. The boat is always immaculate.WOO HOO! We want to do 10 days next time! Well, on our 23rd trip now you are still introducing us to “firsts”. The overnight in Honeymoon Bay with the world-class musicians on Water Island was fantastic. It’s very rare (unheard off) to go to Carnegie Hall in shorts and flip-plops! And then to Maho Bay on St. John to Marina Cay to Leverick. Thank you for joining us at Hog Heaven – what a view! Then to Anegada – thank you for spending the afternoon at Loblolly Beach, gorgeous, especially watching the breakers on the reef. Back on Breanker for snacks and adult beverages – I still can’t believe that sunset – incredible!! Have you ever seen the ocean that still? 30 feet of water and we could see the starfish on the ocean floor. Long smooth ride to Green spit Friday, another first with the wind mostly from the northwest. Then our last night on board anchored in front of the Bee Line. Okay, so I’ve written too much. It was a great trip! Oh, and the food, as always, was gourmet. Hope to be with you guys again soon! P.S. I forgot to mention the lobster dinner with you guys at Anegada Reef Hotel – It was wonderful! Thanks again. This was the BEST trip! Everything about it was perfect – the food, the places we visited and the company! I can’t wait for the next trip down here to do more exploring. Thank you for the best vacation ever! It was so relaxing and everything you did added to how amazing it was. Hopefully we will see you again. This was a wonderful treat to meet you, enjoy your knowledge and hospitality and welcome 2017 with you at the Bitter End Yacht Club. Thank you for a terrific introduction to the BVI’s. We look forward to our next trip! Thank you for a fabulous week. Breanker is so comfortable and well-kept, your pride in your boat is evident! We appreciated your local knowledge and perfect suggestions for our itinerary. The meals astounded us every time – so delicious, great variety and where did you store all the food that kept on appearing? Your calm gracious demeanor and hospitality was the biggest highlight. You made us feel at home and took the best care of us. Thank you for an incredibly memorable vacation. We will be back! Thank you for such a fun and relaxing vacation! The food was perfect and the rum punch was hard to beat. You are the perfect host and hostess. I cannot begin to thank you for the most amazing experience. I never thought that I could be brave enough to sail for a whole week. You made this week so incredible amazing for me! The food was so incredible, and all of our destinations were stunning. You two are so wonderful and I will never forget you. Thank You! I can’t wait to sail with you again. Thank you for the most amazing trip! It would not have been the same without guys! I hope we will be back to see you soon!! Kristian and Marianne, spending a week on Breanker is like coming home for us! I don’t even remember how many times we have been here but you just can’t get rid of us. As always, this week was fantastic – even though we got in troubles for leaving our portholes open – (on the sail back from Anegada). Next time we promise to keep ALL our stars! Dean and Terrie – the only ones left with 5 stars – xxo! Kristian and Marianne thank you for giving us a wonderful vacation. The food was the best ever!! We loved all the places we saw, the ones we saw before and all the new ones. This was a trip of a lifetime for us. Good luck and we hope to see you again. 3rd timers -Kristian and Marianne – Boarding Breanker and seeing you two again was like arriving at my “home away from home”. Your gracious hospitality, cooking and sailing skills are unsurpassed! Loved the sail to Anegada and snorkeling at little harbor. Many thanks to you for a wonderful vacation! Multiple repeat guests aboard BREANKER - January 28,2016 – 16 YEARS!!!! – 20 TRIPS? Well, Kris and Marianne, we made it back!! One of these times we actually have to count the number of trips we have made with ya’ll. It’s been 16 years now since our first and quiet a few times we have been lucky enough to be with you more than once a season!As always, the time this year was amazing! Laid back for us this time – no snorkel or swim trips which was just what we needed!Getting us to our favorite anchorages in time for cocktails, lobster dinner at Anegada Reef, special time with you both on Cow Wreck beach, Anegada, Marina Cay, Peter Island, lunch at The Top Of The Bath – all new wonderful memories to add to our own list.Time on Breanker is always so special – the hospitality, the food – amazing – always SO GOOD, comforts of home and we are always still so pampered and cared for!We truly love you guys and hope to add to our memory and many more times on Breanker!! If not once more this season, hopefully next! !Thank you again for ALL you do and for always making us feel so special!! Repeat guests aboard BREANKER, after a 12 year hiatus! Back again after 12 years! Thank you for another perfect sail in BVI. You out did yourselves again!! Thank You. Thank you for one of the best adventures we have taken. This trip was more than we ever expected. You two are beautiful people. Thank you! WOW what a great week! Perfect weather, perfect p[laces to explore and most of all perfect company with Marianne and Kristian – What a wonderful journey!! 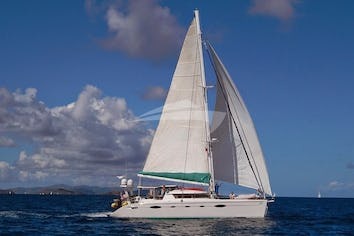 What a great week – Breanker is beautiful and a wonderful boat and introduced us to the BVI sailing so comfortably. But the “big win” Was Marianne and Kristian’s hospitality and friendship. Looking forward to the next trip! Marianne and Kristian, thanks for providing a fabulous and wonderful week in our very first visit to the Virgin Islands (and The Caribbean)! Fantastic food and drink – morning, noon and night! Accommodations are very comfortable. LOVE the rum! Here’s to our brother, the pelican. His beak will hold more than his belly can. Great relaxation, sun and water and wonderful memories. Thank you both so much for taking such great care of us, especially me, during my sickness. The food was outstanding; Curt will speak of that forever. This morning over looking the bays where we spent the nights were spetacular. As every one comments, the food was very special. I have absolutely no reservation of recommending this trip to anyone wanting to visit BVI. FANTASTIC TRIP!